Sandy King (18? ?-1881) – Often riding with more well known and notorious William “Curly Bill” Brocious, King was a cowboy who more often spent his time as a rustler and thief, plying his “trade” in New Mexico and Arizona in the late 1870s and early ‘80s. In late 1880, he was making his home in Shakespeare, New Mexico, where the tall cowboy quickly made a reputation as a hard-drinking gunman. Having a penchant for numerous barroom brawls, he soon became known as the town bully. On one occasion, King got into an argument with a storekeeper and shot off his index finger. The bully was hauled to jail. About the same time, one of King’s friends, a man named William Tattenbaum , but better known as “Russian Bill,” was caught red-handed stealing a horse on November 9, 1881. Bill soon found himself tossed into the pokey with his buddy, King. Acting swiftly, Russian Bill was tried by a vigilance committee who found him guilty and sentenced him to be hanged. When one of the members proposed that Sandy King also be hanged on the charge of being “a damned nuisance,” the committee agreed. Before the night was over, they dragged the pair from the jail into their makeshift courtroom in the dining hall of the Grant Hotel. In his own defense, King pointed out that there were others who had committed much worse crimes than he, who had not been punished, citing the recent case of Bean Belly Smith who had shot Ross Woods in a quarrel over the last egg in the house. The vigilance committee; however, was unsympathetic. 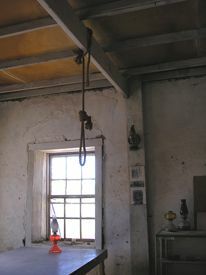 As the lynch men threw the hanging ropes over the ceiling rafters, Russian Bill begged for his life. Sandy King, on the other hand, simply requested a glass of water because “my throat is dry after talking so much to save my life.” After King drank the water, nooses were placed over their necks and they were pulled up and left hanging until they were dead.